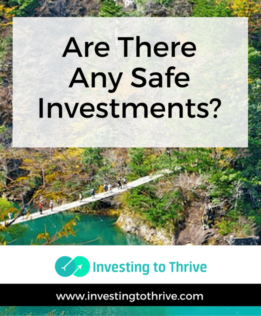 In the past couple of months, I have noticed more than a few articles touting “safe” investments. I take issue with these claims, particularly when safety is not clearly defined. I often think of cash in an FDIC-insured bank account as the safest investment of all. My balance is preserved plus I earn small amounts of interest, varying from .01% to .90% annually or more.There's just one problem. When inflation exceeds the interest rate, I lose spending power. Sure, the absolute value of my cash rises over time. But its relative value falls.This problem is magnified when I buy a multi-year Certificate of Deposit to earn higher interest rates. Let's say I lock in a 2% interest rate for a three-year CD. I'm now earning more than twice as much as I would with a savings account. But if interest rates rise, I should be able to earn much more in a regular savings account that carries no penalties for withdrawals like my CD. Further, the rise in interest rates could be accompanied by higher inflation, eroding my spending power. I like to keep cash for emergency and unexpected bills, plus to position me favorably for a downturn in the market. But, purely as an investment, cash isn't safe from erosion in value. they allocate my investments among asset classes suited to my risk profile. But just because the portfolios have a sound construction doesn't mean that they are completely safe. Steady investment returns are not guaranteed despite what the cool graphics on advisory firms' websites indicate. To a certain extent, market-index funds and robo-advisory portfolios are safe for the investment advisors who sell them to you. Your investment performance should closely match the broader market of domestic and international stocks and bonds. Sure, returns will vary depending on the nuances of portfolio design (some are more heavily weighted with value securities for example), my risk profile, and investment fees. But, generally, when the market rises, the value of my portfolio rises. When the market falls, my portfolio falls also. An advisor can easily accept glory for the increase associated with general market growth or defend her recommendations by explaining that my investments are down because the market is down. There's value in holding a diversified investment portfolio. But it is not safe from a decline in value, particularly in market downturns. Market returns may be negative so my market-index ETF holdings may decline in value. Not all ETFs track market indexes. So my risk of loss is the same with these as if I were buying a basket of stocks, bonds, etc. ETFs trade like stocks so they may sell at a discount or premium to their intrinsic value. When an ETF sells at a premium, I pay more than its underlying value; so, theoretically, I could lose money even if its market index (or the mix of stocks in its basket) rises in value. ETFs are often low-cost investments, particularly if I can acquire them free of commissions. They make investing easy, but they are not free from the risk of loss. Bonds are like loans to a business or government agency, rather than an equity stake that implies ownership. Bondholders (investors) make money by receiving interest payments during a specified term. I can also make money if I buy a bond at a discount (below face value) and sell the issue for a premium (or buy at a premium and sell for even more).Bonds issued by the federal government and highly rated corporations are typically safe in that I should receive interest plus the return of principal. However, bonds issued by some companies and municipalities may default.Further, if I pay a premium for the bond, then I may not be able to recoup the full amount of my investment principal. Bonds are typically part of a diversified portfolio because historically they have performed differently than stocks. Bonds may diversify my risk but I can still lose money by investing in bonds and bond funds. A couple of my first investments were in the utility industry, specifically energy providers. First, I opened a dividend reinvestment account with Duke Energy (then Duke Power). Next, I purchased shares in a utility mutual fund as mentioned by a Fidelity Investments representative. The idea of investing my money for steady growth made sense to me.Often, utilities enjoy a stable customer base and monopolies in the regions they serve. Typically, they are able to plan strategically and spend intentionally on capital upgrades and expansion. As a result, they generally perform well financially and deliver dividends to shareholders consistently. Shares of utility company stock have long been considered safe investments, compared to companies with less predictable cash flow.But things have changed since the 1980s when I first invested in utilities. In the 1990s, the Federal Energy Regulatory Commission (FERC) issued a series of orders that continued the deregulation of energy services. Some states have also deregulated energy services. Basically, under deregulation, companies can sell energy even if they don't produce energy. This set-up means that there are greater opportunities to make money but also more chances to lose money. To make things more complicated from an investment perspective, a utility company may operate in multiple states, some regulated and some deregulated. A good example of poor management decision-making (and a good investment gone bad) at a utility company is Enron. The company tried to capitalize on deregulation by engaging in an energy-trading scheme that contributed to California blackouts in 2000-2001. Further, the company misrepresented its profitability associated with these trades, leading to increased regulation pertaining to financial reporting (specifically, the Sarbanes-Oxley Act or SOX). Enron eventually went bankrupt. Though Enron made national headlines, it was not the only company that engaged in questionable trading and accounting practices. Duke Energy played a similar game. And sadly, its shares fell dramatically during the early 2000s (from $121.86 on July 6, 2001 and $38.25 on March 3, 2003). Scandals aside, a study by a Dartmouth professor indicates that utility companies have not only underperformed the total stock market but also demonstrated greater volatility (though dividends may improve returns). Utility companies can have a place in an investment portfolio, particularly shares of dividend paying ones. But their shares are not 100% safe from risk of loss. Building a margin of safety into my investing decisions is one way to minimize potential losses, but that concept is rarely mentioned in the context of promoting safe investments. So, I've learned many lessons. Pay (as close as possible) the right price. Develop understanding about the strengths, limitations, and best uses of various types of investments. Determine whether general assumptions about safety (as well as risk and return) hold true for a specific investment. Adopt the attitude that I can't be 100% safe but I can make smart decisions. Never being certain about safety can enable me to be more discerning about my investments and make me a better investor.